3.9.1917: Launched by Smith’s Dock Co Ltd, South Bank, Middlesbrough (Yd.No.711) (“Castle” class) for The Admiralty as WALTER BURKE (Ad.No.3532). 29.9.1917: Completed as an armed trawler. 12.1923: Sold to Boston Deep Sea Fishing & Ice Co Ltd, Boston. Fred Parkes, Wyburton, Boston appointed manager. 2.1924: Registered at Boston (Part I & IV) as GONERBY O.N.147962 (BN5). 11.1924: Transferred to fish out of Fleetwood. 5.1925: Slipped at Fleetwood prior to sale. 1925: Sold to S. Eraso, San Sebastian, Spain. 1925: Boston registry closed. Registered at Vigo as TORALLA. 1927: Sold to Pesquera Vasco Gallega Soc Ltda, Vigo. 8.1936: Spanish Civil War; requisitioned and armed by Nationalists at Cadiz. 1942: Sold to Santos Eraso Tirapu, San Sebastian. 1946: Sold to Pesquera Vasco-Gallega Soc Ltda, Virgo. 195? : Converted for burning oil fuel, F.P. above 150° F.
1964: Sold to Vieira Gonzalez, Vigo. 1976: Sold for breaking up. This entry was posted in Steam Trawlers and tagged Boston DSF & I, Castle on May 7, 2015 by Fred Smith. 1919: Launched by John Chambers Ltd, Oulton Broad, Lowestoft (Yd.No.498) (“Castle” class) for The Admiralty as JAMES LAVENNY (Ad.No.4215). 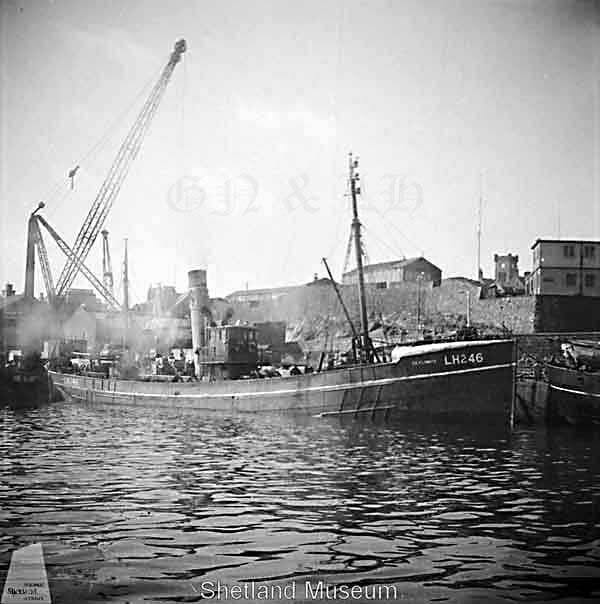 30.10.1918: Completed as a fishing vessel ex fishing gear. Laid up. 1919: Allocated to the National Fishery Scheme for the setting up of the Minesweepers’ Cooperative Trawling Society Ltd, London. 03.02.1920: Registered by The Admiralty at London (Part I & IV) as JAMES LAVENNY O.N.144360 (LO313). 10.1920: At HM Dockyard, Devonport fitted out for fishing under Special Survey of Lloyd’s Register and classed 100A1 Stm Trawler at Plymouth. 01.1922: Scheme abandoned, the necessary working capital of £100,000 having not been subscribed. Laid up at Plymouth. 10.1924: Slipped at Plymouth prior to sale. 12.1924: Sold to Boston Deep Sea Fishing & Ice Co Ltd (64/64), Grimsby. 9.12.1924: Vessel mortgaged (64/64) to Midland Bank Ltd, London (A). 7.2.1925: Registered at Grimsby (GY205). 7.2.1925: Fred Parkes, Wyberton, Boston appointed manager. 1926: Re-measured 297g 91n 125.3 x 23.4 x 12.9 feet. 24.2.1925: Registered at Grimsby as KELBY (GY205) (BoT Minute M/RG1207 dated 24.1.1925). 1926: Fishing out of Fleetwood. 1926: Fred Parkes, Blackpool appointed manager. 15.7.1926: Sold to Oscar Dahl, La Rochelle. 7.1926: Registered at La Rochelle as La BANCHE II. 1939: Requisitioned by Marine Francois as a minesweeper (P.No.AD186). 1944: Transferred to Free French Forces. 1952: Sold for breaking up. La Rochelle registry closed. 20/02/2014: Page published. 3 updates since then. This entry was posted in Steam Trawlers and tagged Castle, Parkes on February 20, 2014 by Fred Smith. 29.3.1918: Launched by G. Brown & Co Ltd, Greenock (Yd.No.108) (“Castle” class) for The Admiralty as JAMES CEPELL (Ad.No.3718). 8.5.1918: Completed (1-12pdr, hydrophone and W/T). 1919: Registered by The Admiralty at London (Part I) as JAMES CEPELL O.N.143859. 1920: Fitted out for fishing under Special Survey of Lloyd’s Register and classed 100 A1 Stm Trawler. 24.08.1920: Registered by The Admiralty at London (Part IV) as JAMES CEPELL (LO421). 2.1925: Sold to Boston Deep Sea Fishing & Ice Co Ltd, Grimsby. 13.2.1925: Registered at Grimsby (GY180). 5.3.1925: Registered at Grimsby as CLIXBY (GY180). Fred Parkes, Wyberton, Boston appointed manager. Fishing out of Fleetwood. 7.1926: Sold to Oscar Dahl, La Rochelle. 7.1926: Registered at La Rochelle as ANTIOCHE II. 1939: Requisitioned by Marine Francois as a minesweeper (P.No.AD285). 3.7.1940: Seized in Falmouth. Transferred to The Admiralty. 12.1940: Commissioned as a minesweeper (P.No.FY.1746). 1944: Transferred to Free French Forces (D42). 1946: Returned to French owners. 1952: Sold to ?? UK. 10.1952: Sold to BISCO and allocated to John Cashmore Ltd, Newport, Monmouthshire for breaking up. 6.11.1952: On delivery voyage, La Rochelle-Newport, broke away from tug and went ashore Isle D’Quessant. Broken up in situ. 20/05/2012: Page published. 6 updates since then. This entry was posted in Steam Trawlers and tagged Boston DSF & I, Castle, Parkes on May 20, 2012 by Fred Smith. Ordered by Kingston Steam Trawling Co Ltd, Hull, purchased by The Admiralty on the stocks. 7.7.1917: Launched by Cook, Welton & Gemmel Ltd, Beverley (Yd.No.340P) (non-standard “Castle” class) for The Admiralty as THOMAS BUCKLEY (Ad.No.3607). 20(24).12.1917: Completed as a minesweeper (1-12pdr). 28.5.1919: Loaned to US Navy (North Sea Minesweeping Detachment). 7.10.1919: Returned to The Admiralty. 28.1.1920: Registered by The Admiralty as a fishing vessel at London (LO276). Official No.144317. 1922: Sold to Kingston Steam Trawling Co Ltd, Hull (Walter Scott, manager). 6.11.1922: Registered at Hull (H724). 27.11.1922: Registered at Hull as CEYLONITE (H724). 29.1.1930: Sold to Taylor Steam Fishing Co Ltd (64/64), Grimsby. Charles Taylor appointed manager. 1.2.1930: Registered at Grimsby (GY170). 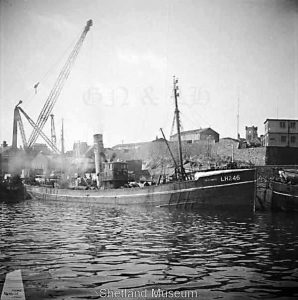 22.6.1939: Sold Saint Andrew’s Steam Fishing Co Ltd (64/64), Hull. 27.6.19: Basil Arthur Parkes, Thornton-le-Fylde appointed manager. 9.4.1940: Requisitioned for war service and employed on patrol duties (1-12pdr) (Hire rate £72.12.6d/month). 9.1941: Fitted out as a minesweeper (P.No.FY1853). 9.10.1947: Sold to Joseph Croan (64/64), Newhaven, Edinburgh. 3.12.1947: Joseph Croan designated managing owner. 12.1947: Registered at Leith (LH246). 1960: Sold to BISCO (£2750) and allocated to Shipbreaking Industries Ltd for breaking up at Charlestown, Fife (Contract No.77E). 14.6.1960: Delivered Charlestown from Granton under own power. 20/05/2012: Page published. 6 revisions since then. 24.9.1918: Launched by Bow, McLachlan & Co Ltd, Paisley (Yd.No.361) (“Castle” class) for The Admiralty as GEORGE DARBY (Ad.No.3681). 20.10.1918: Completed (1-12pdr and W/T). 1920: Allocated to the Government scheme for the setting up of the Fishermens’ Cooperative Trawling Society Ltd, London. 1920: Converted to a fishing vessel. 31.08.1920: Registered at London (LO461) O.N.145017. 01.1922: Scheme abandoned. Laid up. 11.1923: Sold to Sam Robford & Co Ltd, London. 05.12.1923: Registered at Aberdeen (A953). 1925: Sold to Boston Deep Sea Fishing & Ice Co Ltd, Fleetwood (Basil A. Parkes, manager). 30.1.1925: Registered at Fleetwood as BULBY (FD34). 1925: Sold to Gumersindo Roura S.L., Corunna. 1925: Re-measured 287g 117n 120.7 x 23.3 x 13.5 feet. 2.1925: Registered at Corunna as GUIMERA. 1936: Seized and armed by Spanish Nationalist Navy. Renamed VIRGEN del CARMEN (1-76mm, 1-45mm, 1-MG). 12.1936: Captured by three crewmen and sailed to Bilboa. 3.12.1937: Recommissioned in Basque Auxiliary Navy as DONOSTIA. 3.1937: Heavily damaged in action with Spanish Nationalist cruiser CANARIAS off Cape Matxitxako. Escaped and interned in La Rochelle. 1939: Returned to owner, repaired and reverted to GUIMERA. 19?? : Converted for burning oil fuel, F.P. above 150° F.
1967: Sold for for breaking up. This entry was posted in Steam Trawlers and tagged Boston DSF & I, Castle on May 19, 2012 by Fred Smith.